Microsoft has announced the Xbox Games with Gold lineup for April 2019. First up, members on Xbox One can download The Technomancer from April 1 to 30. Set on Mars during the War of Water, The Technomancer is a sci-fi RPG. Threatened by the secrets of his past, an aspiring Technomancer must navigate hostile environments searching for answers that could be the key to protecting his future. Next, members on Xbox One can also get Outcast: Second Contact from April 16 to May 15. Play the complete remake of the cult-classic that started the open world, action-adventure genre in Outcast: Second Contact. On Adelpha, an alien world as beautiful as it is dangerous, explore magic and science and make the right choices to save the destiny of two universes. For members on Xbox 360 (and Xbox One thanks to backward compatibility), the original Star Wars Battlefront II will be free from April 1 to 15. Either play the campaign of a veteran clone trooper reminiscing of his time in the 501st Legion or enjoy multiple gameplay modes. Fight on foot in the front lines, use the force powers of a Jedi, or dogfight in space in your favorite starships, all in 16 exotic locations. Lastly, available April 16 to 31 on Xbox One and Xbox 360 is Ghost Recon: Advanced Warfighter 2. In the year 2014, rising conflict between Mexican loyalists and insurgent forces throws Mexico into full-scale civil war. Under the command of Captain Scott Mitchell, the Ghosts are called upon to face an imminent threat to the United States. 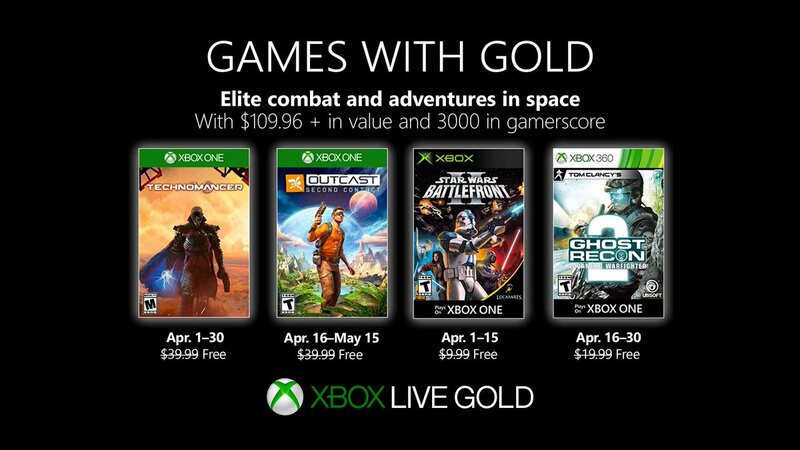 These titles are available as free downloads for a limited time, for qualifying paid Xbox Live Gold members in all markets where Xbox Live is available.